A shelter response team from the charity ShelterBox has arrived in the Burmese capital Rangoon. The four-strong group, which includes two firemen and a policeman, will help victims of the recent cyclone. 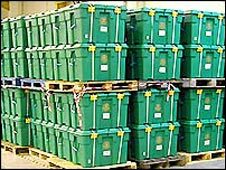 ShelterBox, which is based in Helston, Cornwall, has also supplied 200 aid boxes each containing enough equipment to house a family of 10 for six months. A further 1,000 boxes are being packed in Helston to be sent to Burma as soon as possible. The shelter response team is made up of volunteers who have taken time off from their full-time jobs. Up to 100,000 people are feared to have died in the disaster and many more are missing. Hundreds of thousands of people are said to be without clean water and shelter, with some areas still cut off after the cyclone hit on Saturday. ShelterBox distributes boxes containing a 10-person tent and enough equipment to house a large family for at least six months.